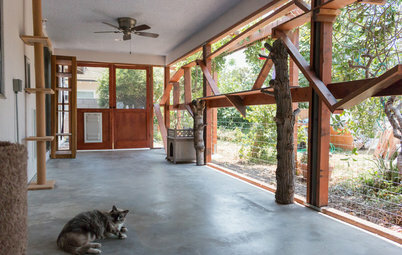 As our lives revolve around our beloved critters more, we need to make space for them. 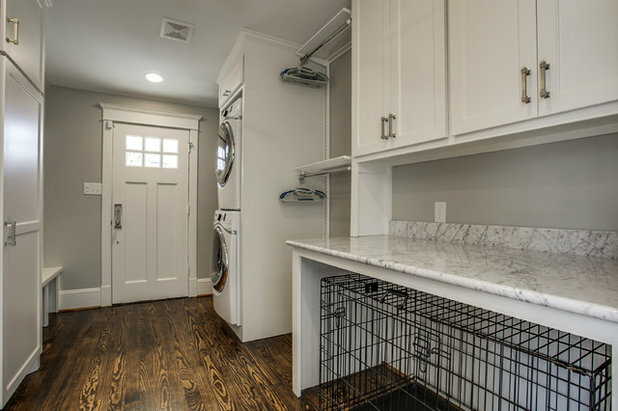 If you have at least a medium-size laundry room, or a combined laundry room-mudroom, it’s prime real estate for dog needs. 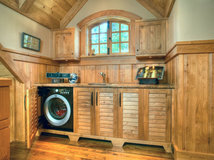 Pet-washing stations can also double as a place to rinse off muddy boots and rinse out laundry. 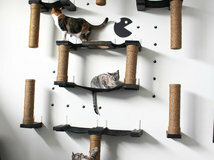 And if well-planned, these rooms can also provide space for pet beds and crates, food and treats, toys and leashes. 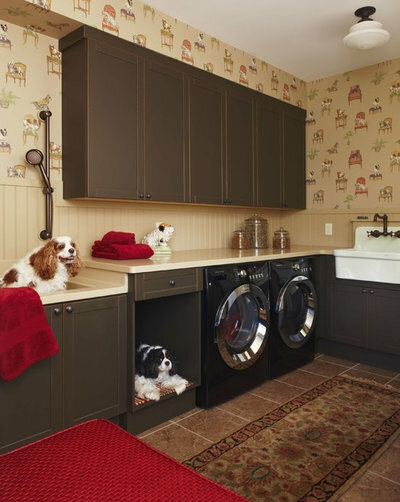 See how some people are outfitting their laundry rooms to work for their dogs too. Grooming. 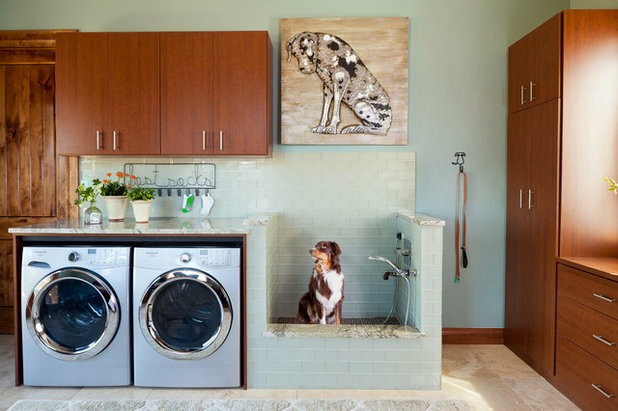 Pet washing stations can be quite handy, and the laundry is an ideal place for them. A dirty dog doesn’t make it past the mudroom before cleaning up, and they are also a good place to clean off muddy cleats and let snowy boots drip dry. 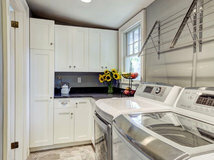 Here, the designer integrated rods for hanging clothes to dry over the dog washing station. Just be sure you don’t have you Sunday best up there at the same time you’re washing your dog — that big shake afterward will have you washing them all over again. 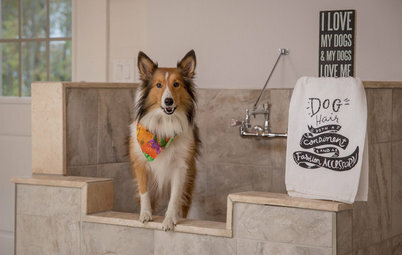 An elevated dog bath is a good option for those with bad backs and knees who have small to medium-sized dogs. It can also double as a utility sink. 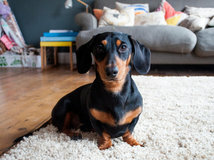 But the main reason I absolutely had to include this photo is because the dogs in the photo match the dogs on the wallpaper. Beds and crates. 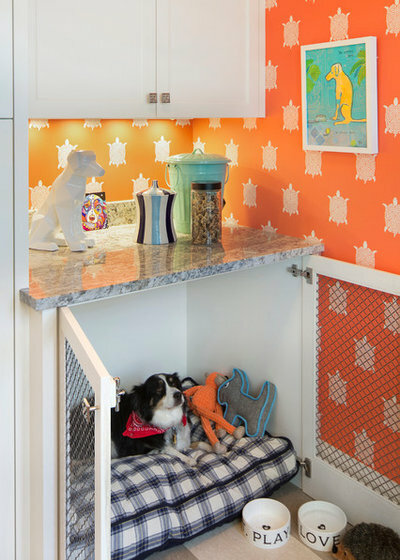 Rather than lower cabinets, these built-ins incorporate a dog bed. 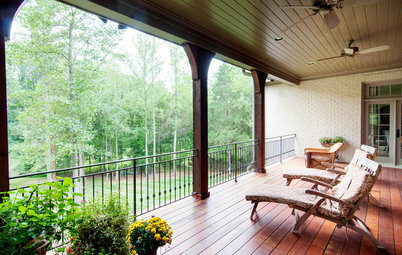 Yellow and white stripes and beadboard make it a cheerful design asset as well. 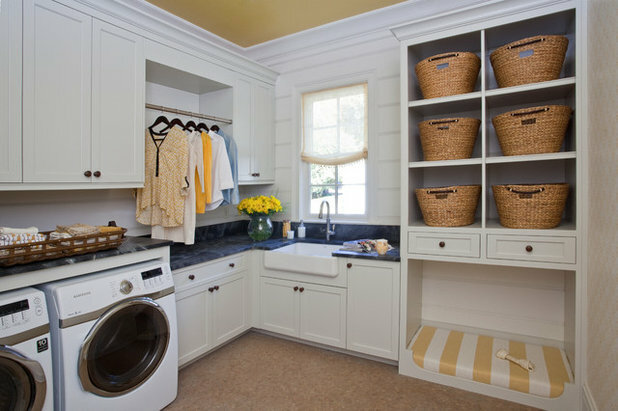 The designers did a great job of maximizing this laundry room wall to fit in a pet washing station and bed. This is just a gratuitous adorable dog shot. 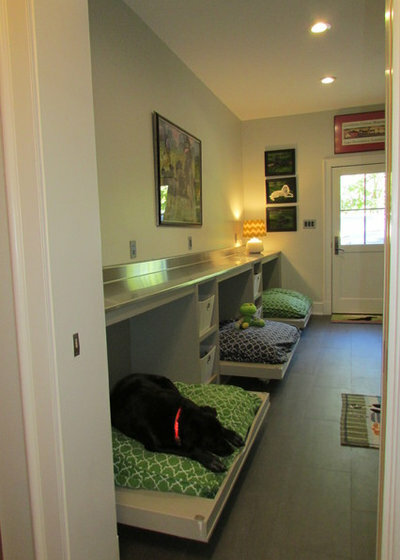 These clever Murphy dog beds fit right in with the rest of the cabinetry, then flip down for nap time. 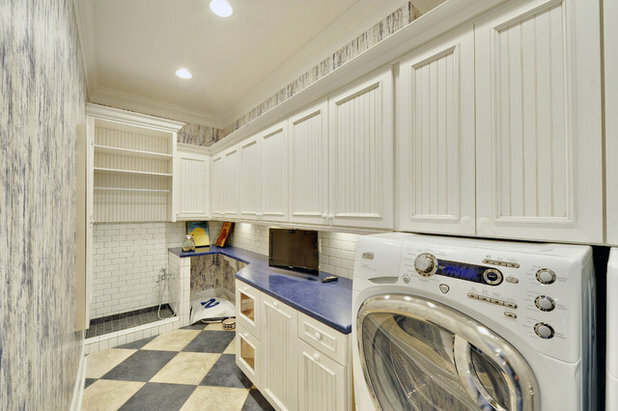 Though narrowness doesn’t appear to be a problem in this laundry room, this is a clever solution for a tighter space. 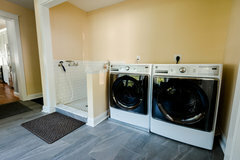 You can flip the dog bed up if you need the room to access a front-loading washer or dryer. 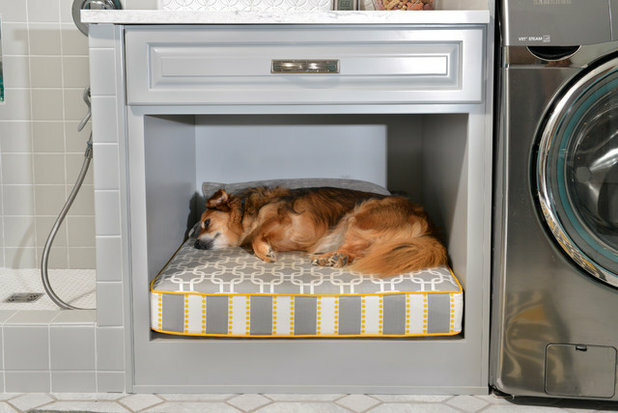 Built-in dog crates are another good option. 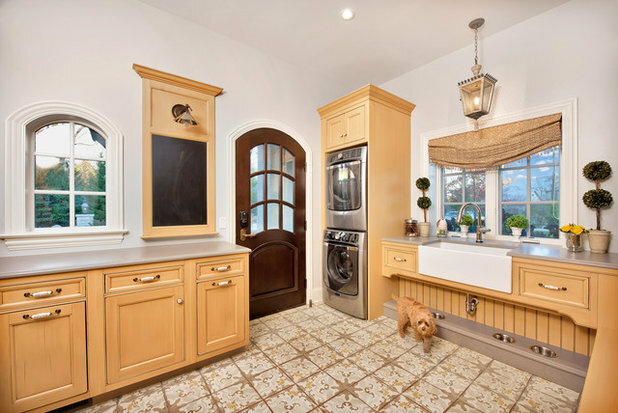 Cabinetmakers can trick out cabinets to serve as dog crates for a seamless look. They can also design counters and cabinets to fit around portable crates. 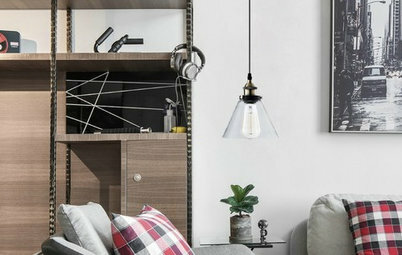 This attractive crate gate is a savvy solution, easy to open and close. Under-the-stairs space is a good place to look for this extra crate space. Pet food. Keeping pet food close to where the pets eat makes mealtime easy. 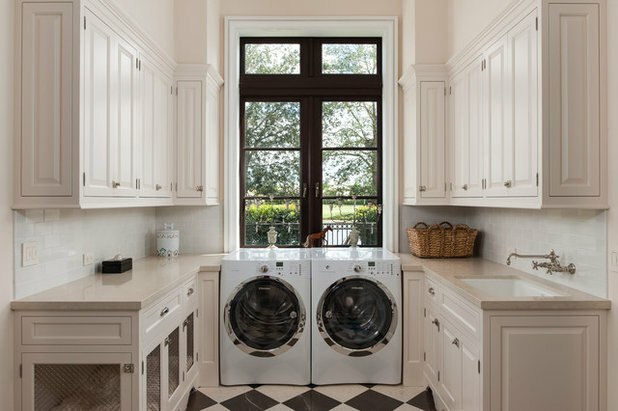 Laundry-mudrooms are often a convenient place to set this up. 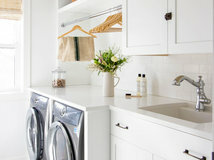 The space under a utility sink is prime for a domesticated version of a trough. Pet bowls slip right into custom holes for easy filling. They stay in place rather than sliding all over the floor when a hungry dog is going to town on them. 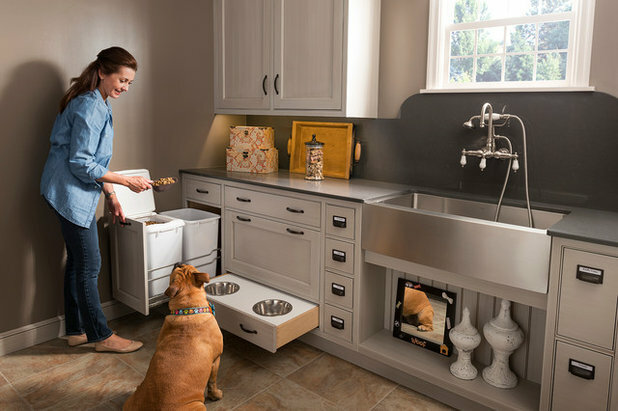 This pullout pet bowl drawer slides out of the way when mealtime is over. 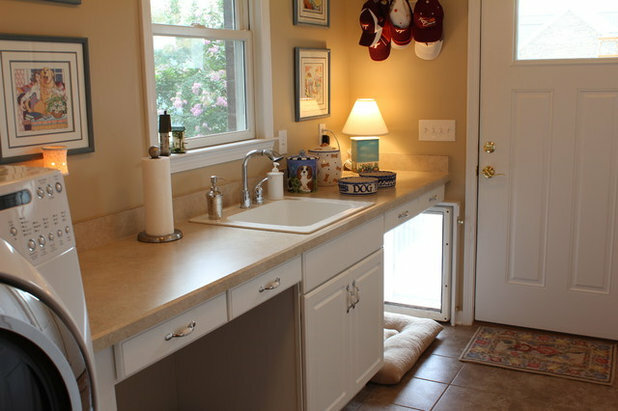 This pet water and food station even has its own bowl filler and a drain below for keeping things neat. 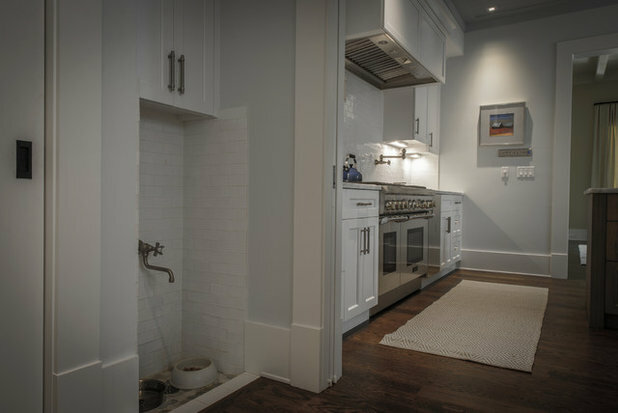 Personally, I don’t know that I’ve ever filled a pet bowl without spilling a bunch of water on the floor — perhaps the large number of pot filler-mocking Houzzers may find a pet dish filler more useful. (Let us know what you think in the Comments section.) 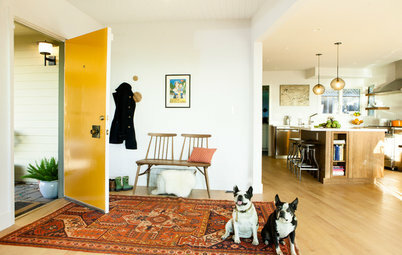 There is adjacent storage for pet medications, leashes, food and treats. As someone who orders pet food at least 16 pounds at a time, I can attest that it’s hard to find room to store it. Big bins are wonderful for keeping it contained and fresh. 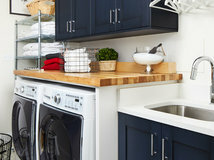 A designated spot under the countertops takes care of storage, and casters make them easy to access. Easy entering and exiting. 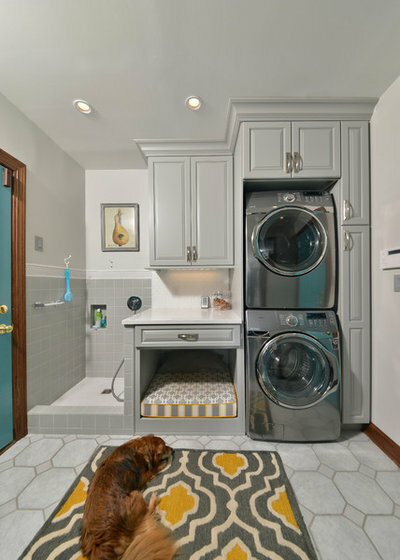 This laundry room has a motorized pet door. 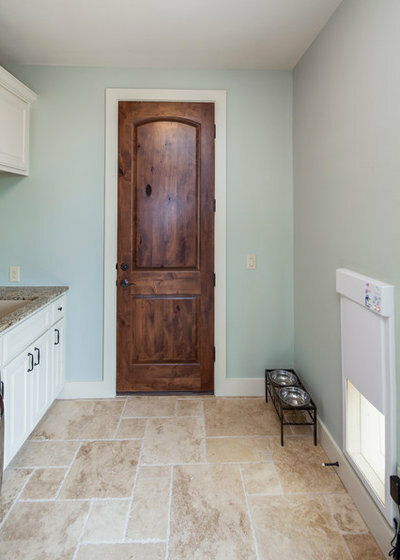 The door opens when the pets wearing their power door collars want to go in and out, thanks to directional ultrasonic detection circuitry. 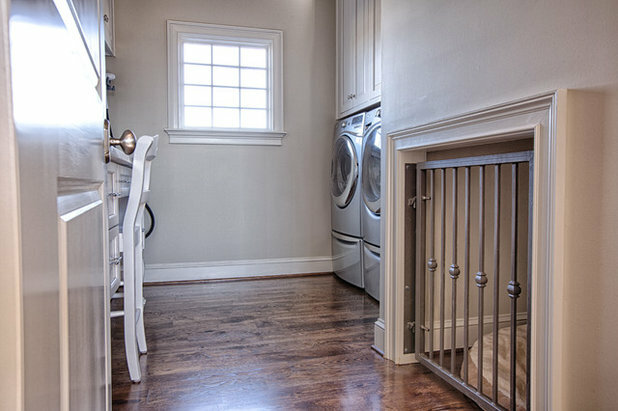 This smart laundry-mudroom has the dog bed placed right next to the doggy door, giving the dogs some good light and a chance to pop outside with ease. 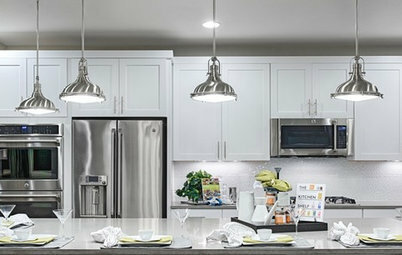 It also allowed for countertop space overhead. 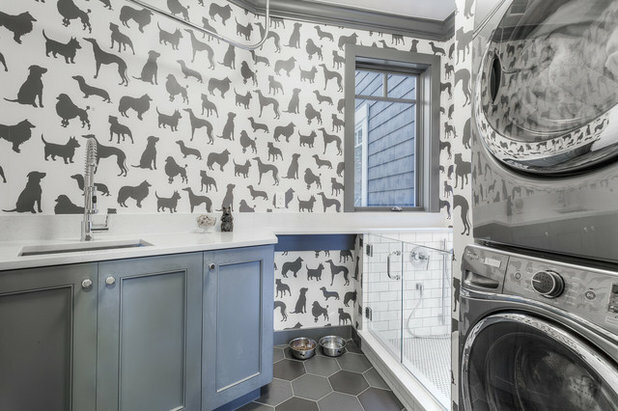 Let’s wrap up with a laundry room that’s fully gone to the dogs, thanks to Osborne & Little’s “Best in Show” wallpaper. A full doggy pet washing station has a view out the window for the groomer. 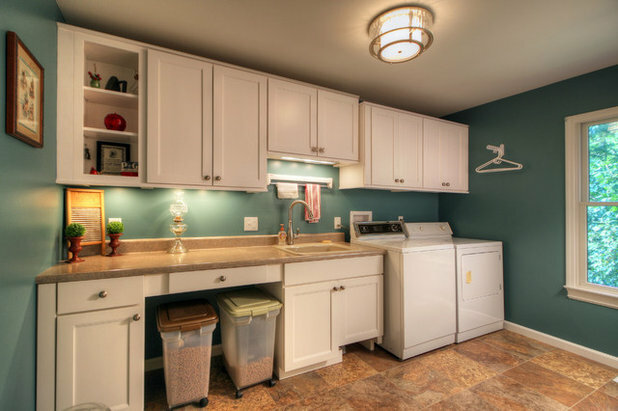 Tell us: Does your laundry share space with your pet needs? Please tell us about it in the Comments. 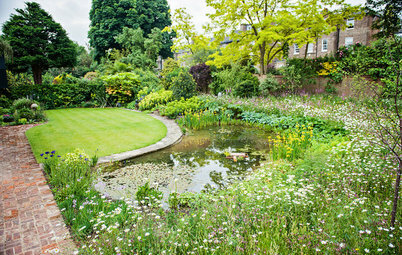 Lovely article! 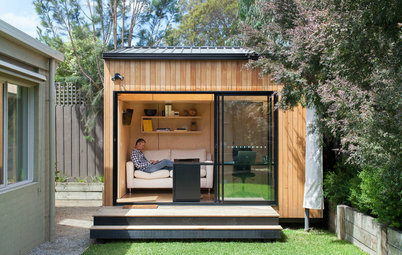 So many different ideas for different spaces and price points. I love it!! 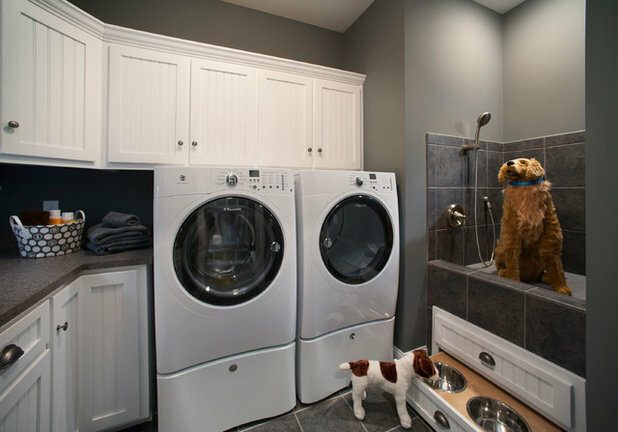 Here's a small but functional design we did for a homeowner that lives off the water and wanted a wash area for his dogs in his mud room! dont put a dogs bed next to doggie door, if it gets stuck, could be too cold or hot, also if you have more than one dog, that may be too close for comfort going in and out, their beds get messy dirty.